20 Top Bloggers & their blogs to follow in 2015! →20 Top Bloggers & their blogs to follow in 2015! Here are some top bloggers I recommend you follow this year 2015. I have followed some of them since 2012 and constantly, they deliver value. I have also featured some of these on my blog here before so I can tell you from my practical experience that dealing with them individually is worth every bit of your time. Now, why do you have to care about who is featured here on the list of tops bloggers? It’s important to to know and interact with people. I have said a couple of times that you can’t succeed as an Island. Show me any successful blogger and I’ll show you one that has a huge community of active members. If you are on the list, I want just to remind you that you are very important to me and I cherish every moment you spend here on my blog. I know I have interacted with many of you on a more personal note. We have had a chat a couple of times on social media and this year, one of the things I work so hard to do is to make sure our relationship grows. If you are here, I want you to know I visit your blog and that’s why I want everyone here to come over to yours. You are special and your articles are just awesome. So I’ll very much appreciate if you share this post on social media, link to it from your blog and let others know you are awesome. Send me link if you mention this post somewhere. NB: Before you continue, here are 15 top bloggers who shared with us how they make money online. I know I have not listed everyone that’s a top blogger. I accept my limitation. However, that doesn’t change the fact that you are awesome. As we continue, be very sure that better days are ahead. 20 Top Bloggers & their blogs to follow right now! Donna Merrill is a must-follow lad and her blog is constantly getting better. She has a soft voice. Yes, I can hear her when I read her articles. Donna & David have great products for bloggers and I promise you both of them will soon be here on this blog exclusively to give details of their products. Hey! My second guest article for 2015 just went live on Donna’s blog and I’m so excited she invited me 😉 It’s on fire so you have to check it out as I share some little known tricks to boost affiliate commissions. Here is the article. Check Donna’s blog out here! Don Purdum is the magic button of doing business online. I didn’t make a mistake in saying that. Just spend some time reading his articles and you’ll find out yourself. Knowing the business you are into. Know the problems you are trying to solve. Know the people whose problems you are trying to solve. Don makes you to understanding that success online/offline in business is about solving problems and that’s indisputably true. Follow Don if you want to take your business to a different level. Give him a call for business coaching. Check out Don’s blog here! There is no way I can talk about Top bloggers this year without mentioning Kevin Duncan. One thing you’ll notice is that this guy has a unique writing style. Kevin has a background as a teacher and that explains why he’s post often go deep into the topics he treats. He’s one of those that helped me in the beginning of BroadedNet. You can’t end this year without hooking up with this brilliant guy. Here is another tough lady you have to hook up with this year 2015. Sherryl Perry taps into her past experiences (as a teacher, CIO, business owner and consultant) to provide her readers with easy to understand information with concrete examples of what works and what doesn’t. Mi Muba is a veteran media professional with 20 years multiple experience of public relations, media management, event management, public awareness, social media marketing, content marketing, journalism and blogging. Mi is now a full time blogging sharing exceptional tips on how to be a money blogger on his main blog. If you fail to connect with bloggers this year, don’t fail to connect with Mi. Check out his main blog here! Erik Emanuelli is a personal friend and I love that he’s always there to share his ideas with me. He helped me out on BroadedNet and is one of the top users. Now, if you have not connected with Carol, I recommend you stop here first and check out her blog, follow her on social media and send her a mail. She’s a very fine lady with a sharp eyes for quality. Her blog is pure air and makes you feel comfortable reading. Have you been to paradise before? The answer definitely is no but here’s someone who is right there and blogging. Ryan’s fingers already know the keyword so well that he can publish exceptional ebooks so frequently and write great posts of thousands of words. Ryan is a ready-to-help guy and despite being busy traveling and blogging, he creates time for his readers. He came to me when I needed him to put a few things right with BroadedNet. Ashley Faulkes is an expert in online marketing and creating WordPress sites. He’s been in the field of Website Design for over 12 years so you understand why he is the go-to guy to get your site up and running. Ashley is also a social media expert, focusing on training companies on how to use Twitter for business. In his advanced course “Twitter for Small Business“, Ashley shows you how to do everything from optimize your profile and tweets, find great content to share, increase your following and much more. Sue Anne is a blogging coach so if you need one, time to contact her. She believes that smart bloggers who want to be successful need to be able to communicate, connect, create anticipation and be able to persuade others to build their business online. This however turns out to be tough for many. Many businesses are experts in their fields but they still lack the skills to connect repeatedly with their target audience. Sue is here for you! Check out her blog and connect with her! Maxwell Ivey is the most exciting blogger I have come across because of his force and move forward despite his physical challenges. Yes, the guy’s physical eyes are blind but he really isn’t. I think the real blindness is when we fail to make use of those eyes. Some people like Maxwell don’t even have those eyes in their right order yet they do exploit. I’m highly convinced you’ll be excited meeting Max. He’s definitely a top blogger to follow this year 2015. Now, let’s meet the guy that has moved from zero to Worth blogger. Definitely, Jackson is a blogger to connect and stay with from now hence. With impeccable writing skills, Jack (as I call him) has featured on top blogs including ProBlogger.net, JohnChow.com, SearchEngineJournal.com, etc. He’s one of the strengths behind BroadedNet and constantly talks to me on ways to make the platform better. One of the bloggers I spend time with on chat and phone is this guy. He’s not only an awesome blogger but an interesting friend. You can’t fail to network with him. Connect with Jack on his blog! My list of top bloggers to follow this year cannot be complete without Sherman Smith. He is computer technician/network administrator, he plays piano and conga drums, and on top of that he dances salsa. Of course, Sherman is a pro-blogger you should connect with this year. Now, you need to spend sometime on his blog to know what I’m talking about. Deborah Tutnauer is one of the bloggers I came to connect with just last year and I have become so hooked to her style. She’s not only a top blogger but a business coach you have to listen to. If you are leaving your corporate job or making a career change and searching for the right business idea and format for your entrepreneurial venture, here is Deborah to hold your hand through. Now, there are also frustrated entrepreneurs who have already spent time and money on training, coaches, retreats, education, and are still not seeing the results they desire. Give Deborah a try this time. Monna Ellithorpe is a wonderful person from whose blog I came to know about Power Affiliate Club (PAC) where members help themselves to make money with Affiliate Marketing. She’s been doing Affiliate Marketing since 2000 so you see where she can take you to with her well of experience. She’s one of my top bloggers to connect with this year and if you want to be an author, you really have to hook up with her. Here is her blog so connect with here! Reginald is an awesome friend, is a serial entrepreneur, marketer, blogger and consultant from the small country of Malaysia. This guy is a WordPress lover who has been creating multiple websites for himself and clients. His latest project AskReginald.com (in beta) is a solid platform that brings other top bloggers and influencers to collaborate and find lasting solutions to problems. If you are an entrepreneur, blogger or just want to make it in the new world, that’s probably one resources you should not overlook. Sign Up to his platform now! The truth is it’s difficult to list top bloggers this year without Harleena Singh of Aha-now. She is noted for her ability to drop excellent comments and help promote newbies. Working closely with her partner Vinay, they have succeeded in putting up a blogging community (AHA!NOW BLOG COMMUNITY) which is fast growing to be huge resource center for bloggers. Are you already an AHAIAN? Connect with Harleena on her blog here! Adrienne Smith is the top blogger who has given so much to the blogging world. She’s the engagement superstar and she will stop at nothing to help everyone know how it’s done creating and maintaining fruitful relationships. Her product Build a Blog Community is the most recommended training course if you want to take your blog to a whole new level. Adrienne has been known for her willingness to support new bloggers gain exposure through constantly reading, commenting and sharing their blog post. Definitely, she is one of the top bloggers to hook up with and follow in 2015. Check out Adrienne’s blog here! Joy Healey makes connection exciting. Since knowing and connecting with her, I have enjoyed a lot from her constant presence on my blog, sharing my articles, blogging about my products and linking back to my blog. I think Joy knows the secret of maintaining a relationship so I highly encourage you hook up with her this year. She’s definitely the top blogger to create a relationship with. Connect with Joy on her blog here! James is an awesome young man who has taken the drastic decision to drop out of school to dedicate more time towards achieving his entrepreneurial goals. James is a wonderful blogger and writer. He’s someone I encourage you hook up with year. It’s not been long I know him but constantly reading his posts, I definitely will not want to miss out his growth this year. James is dropping out of college! Read more! Now, these are some 20 top bloggers to connect with this year. The reason of this post is to help you grow in relationship. These are well chosen bloggers. Some of them are young but I think they are TOP (because Top doesn’t mean old) and if you visit them, you’ll understand why they are. Drop a comment below and let’s know what you think about these top bloggers. You may also let us know about you and how we can connect with you and grow as bloggers. Hope after 5 years, i will appear in this list ? Great list. I always get in touch with all the bloggers. They are a big inspiration for me. Thanks for the awesome share. Wish you a very bright future. Very informative and inspiring content, your blog is a great place for beginners to learn how to earn money. Blogging is really a something that can earn sufficient money. These list inspired the maiden bloggers like us. Thanks for the post. Thanks for the post Enstine. It will really inspire the maiden bloggers to do something better in this field. Really a great thing it is. I was searching for something like this posts on google today for a narrow list and found many posts with a huge list. This list of yours is really up to the point and I am going to note down all these top bloggers and will try to update with them regularly.Thanks for sharing such a great post and have a great day!! All blogger in given article, are legends on this field. When I started my journey, I read the blog of these bloggers included this blog also, and getting bunches of information and grow it. Great article! Thanks for the article, definately will follow…. You have crafted ultimate list of top bloggers, I have checked some of them and now I am bookmarking to this post, to read rest of them in morning. You should need to include enstinemuki ‘s blog in this list because apart from these bloggers you also always share informative guide for bloggers and marketers . I like your way of writing that is really amazing always . First of all thanx for making such a post. learning more & more with your informative articles. Gosh I’m so honored to have made your list again – thanks so much. I really appreciate the shout-out. Big apology for being late here to thank you, but for the best of reasons. Your publication date was the date I was winging my way over to USA for a much needed holiday and I kept it mostly Internet free. I only just returned – thoroughly jet-lagged and with a rotten cold – but seeing your post has cheered me up no end. How long was that flight of yours though? Oh my goodness – 22hrs is a looong time. For my return trip it wasn’t so much the time in-flight which was “only” about 10 hrs, but I had connecting coach trips and flights to do as well, plus a delay on the runway, so 18hrs travel time and together with the 6hr time difference I was wiped out when I got back. I pray you will have a safe and comfortable trip. Looking forward to hearing about your adventure! Really great list you shared with us. I already follow some of blogger from 2014 in which Adrienne Smith Mam, Harleena Mam, Mi Muba sir, Donna Merrill Mam, other blogger are new for me but I will follow all these blogger to learn about blogging. Thanks Enstine sir for sharing such great blogger with us. Really you are amazing Man, Good luck for your future. Great list of top bloggers! You have come eveytime with something excited. I have bookmarked this post, since I know some of them and need to check out rest of them to connect with them. Thanks to craft this superb list! This is are the top bloggers in the world. They inspired me to take my blogging career to next level. Good article. All the people you included here are indeed good at what they’re doing even though I’ve not visited some of them before but from your descriptions, i think they are cool. I will take time to check them out especially the ones i do not know yet. Wow what are fantastic list of bloggers, I am always on the look out for new information from inspirational people. This is really a unique list for me.I never visited any of blog from this list Except Aha! Now of Harleena Singh. I am pretty excited to read these amazing blogs.Thanks for this great and unique list Buddy. From last 2 months, I have been started following your blog and now I become a BIG fan of yours. Where is your name in this list sir…? You are plain awesome man. Super thankful for linking and and just added into my social queue. You seem to be rocking hard and really appreciate it! On the side, hope you are in good health my friend! I won’t be here without you being there. thanks for being a wonderful community member. I am a great fan of your blog. And i also love Donna, Sherryl, Mi- Muba, Erick, Adrienne, Harleena, Sue Anne’s blog too! They all write well and share their knowledge with us. Anyway, thanks a=for sharing this great post with us. Nice list of bloggers (super bloggers)you created, but one thing I did not understand as a new blogger this list is based on Alexa ranking or google page rank . Because why am asking here means lot of sites they don’t have any PR but they get lots of traffic and they are in google first page. so why we need the google page rank and purpose I saw some sites they don’t care about the PR . So page rank is just for an ornament for the website . All My Favs Are In! Wonderful and most excellent and calculated selection for the year. I appreciate you and all the dear ones in the list. They are all no doubt ruling the roost! Keep up the good works my dear friends. Especially I appreciate the young ones. And May you all have a wonderful and profitable weekend. The bloggers you mentioned are awesome and it’s good to say I’ve been to all their blogs and can vouch for their thoroughness and intense value – things not seen often in the blogosphere. More grease to your elbow…and a big congratulations to the folks mentioned. Thanks man for stopping by to share a word on this post. These indeed are great minds so it’s a wonderful thing to hook up with them. I have the pleasure of knowing some of the bloggers you mentioned here and some who I would love to connect with. And you have to include yourself on this list my friend. You’re awesome yourself! Yeah, these are tough bloggers and I’m glad I personally connect with them. Hi Muki thanks for sharing this, i hope that i would also come in the top 20 bloggers soon. Thanks once again this motivates us to work hard.. Thank you sir for giving us list of top 20 bloggers to be follow in the year of 2015. In this list I already know Mi, Adrian,Mrs Singh and other bloggers are unknown to me. Also my recommendation is to adding you too in this list because I am learning lots of new things from your end. I’m glad this list is linking you up with some great bloggers. Thanks for this list. While I know some of the bloggers listed I do not know them all. I will make sure to check out the ones I do not know as I trust your opinion. I hope you are well. That’s a wonderful thing to do my dear friend. Connecting with those you don’t know is the reason for this post. The list is very useful for new bloggers who want to build a reputation in Blogging field. Thanks for sharing such a great information. Nice list I can recommend Donna Merril her blog! I love Donna Merrill her blog!!! It’s awesome! You should read some of her blogposts! Hi Enstine, nice list here although I know some of this bloggers before but I can still see some I just heard their names and some I don’t know at all. It’s good you have listed them and this should help in getting contact with them for any help. Awesome List Of Top Bloggers. Proud to Indian blogger in this top 20 bloggers list. And thanks for sharing this list will surely check out each and every blog in this list. Enstine Muki: I am glad to see that you listed Erik Emanuelli. I interviewed him on my podcast show, EGO NetCast, this morning. You will be able to listen to our conversation next week! Great List here! I am knowing more and more bloggers to follow, and these ones seem just perfect for me, by the way Mr. Enstine, I don’t know how you did it but the graphics you used to present this post is amazing. Thanks for sharing this list and details with us all. Thanks to share this great list with all of us. A great list you have shared. I regularly visit some of them blogs. I want to include one more blogger name and his blog in this list. The name is Enstine Muki. You are also one of top bloggers in blogging world and your blog also very informative. Thanks so much for share this list. Wow, I’m greatly appreciated that you mentioned me. But what’s amazing to me is that the blogosphere is a big place and I know 99% of these amazing bloggers. I do have to say that I’ve learned a lot from them and you. If it wasn’t for all of you then I wouldn’t be where I am now. I’ve gotten a lot of my ideas and solutions from all of these bloggers. This goes to show how valuable the content they present is! And some have gone out of their way to point out some of the problems I have had with my blog in the past. This community is quite cohesive and supportive of each other. You my friend have came up with an amazing list and I believe that no one who is trying to find success through blogging should sleep on these bloggers! 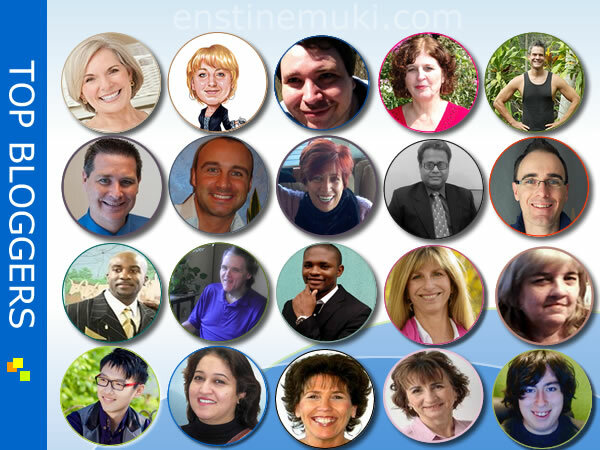 Thanks for the share and including me amongst these amazing bloggers Enstine! I hope you have a great week ahead! I guess it must be really hard for your to pick these top 20 bloggers as they are thousands of bloggers in this world and i must say I’m following almost all of them from this list. I’m going to be following them now, too! though coming to the point Donna and Reginald my friends i have learnt a lot from their blogs and comments, and of course kevin duncan the commentator, and ryan the king of island blogging! and others too! loved them man this is very inspiring one! thanks Enstine! i was missing out many things here! will be back send me amail for next post! OK, I’ve had the hardest time to comment on your blog. It keeps telling me that I’m a spambot. This is a great collection of bloggers, was just wondering why I wasn’t there :)? Anyways, great bloggers and great people. Hope this one goes through. Seriously I know 95% of this bloggers, I respect them so much, they are hard working. Thanks for the Insight Mr Enstine. Just hope my blog grows as popular as their’s and yours. Thanks to this list, Enstine. This list is worth paying attention, the bloggers you featured here are exceptional and talented internet marketers too, not just a blogger. Though, I would say I already know and interact with half the list…but still have many I just never have the privilege of reading or visiting their blog. So this list comes handy, thanks for sharing. Thank you so very much for this privilege to be on this list of top bloggers. I was totally floored when I saw my name among some of the best known bloggers online. There are a couple that I have not had the pleasure of meeting or reading their blogs yet but I will be doing that soon. Thank you again, and have an awesome day. It is not easy to gather such information from the experts but still you did it. I am already following few of them like Harleena Ma’am, Erik, Mi Muba Sir etc.. But going to follow them all you mentioned above. Btw, you CommentLuv plugin isn’t seem to be working. Can you please check what’s wrong? This is my very first visit to your blog and I am feeling lucky to visit your blog and read such a great post. All these top blogger are truly a source of inspiration and motivation for newbie bloggers like me. Thanks… i am surely going to visit your blog again. These bloggers stories are very useful….Each blogger needs some stuff which will inspire him/her…Your blog is really useful for new bloggers like me and it has boosted my confidence. What a fabulous surprise for a Friday night! Thanks so much for including me in this list of great bloggers. I’ll certainly be including this mention in my next post and doing some sharing! You have helped my blog along so much with the plugins and tips you have written about, so thanks for them all. Gosh – you must have spent ages on the graphics. What a fantastic post. Thanks again, and I hope you have a well deserved rest over the weekend. This is a wonderful list of top bloggers and their blog. They all are really awesome bloggers and engaging with them will surely help me to learn some more new things. Thanks for dropping your voice. Yes, connecting with these bloggers can make things awesome. If someone seeks my advice what to do if he does not have time to follow all these wonderful bloggers; my advice will be so honest, straightforward and without any pause. I would advise him to then follow simply one blog to cover up not following all of them. And that one blog is obviously YOURS. As far as I am concerned; I would try to follow all these great blogs and would also follow my own blog as well because this advise is none other by you – one of the greatest bloggers of the world. No more words I have to show my gratitude and pleasure on being mentioned once again, as I got that honor several at your wonderful blog and this time being in this list of amazing bloggers has lifted my passion to the height of the sky. Much honored and feeling so blessed. Thank you my dear Enstine. I wind up themse comments without a pause of single moment because I just had to hear the voice of my heart to transcribe it here in words. It’s difficult not to notice you man. I actually and sincerely don’t remember when you started but your coming on scene was with force. Who could see you as a newbie? You definitely have something strong to give out. I may not have been commenting and engaging more strongly on your blog lately but I have been a silent consumer. The quality of your product is such that I desire to let others know about it. You did not escape my radar on this post. You deserve to be followed this year and beyond. Do have a wonderful year 2015. I know you have a lot to give us so I’ll star hooked. Wonderful list of great bloggers. I already know these all here and have a good connection with almost all of them. This is good to know some more details about them. Thanks for sharing this list and their details with us. What a pleasant surprise reading yet another wonderful roundup post. This time I think this is bomb! How well you took me unawares Enstine. We were just chatting on Skype when you told me you were working on your next blog post and little did I know you had coming. I really appreciate the mention bro. Like Donna and Adrienne rightly mentioned, these bloggers are all awesome and I consider them as family. Meeting and engaging with them has remained the best thing that has happened to me as a blogger. With each and everyone of them doing what they know best, the blogosphere has continued to flourish because day by day new content especially problem solving content are pumped into the blogospshere helping people to learn, earn and grow. This is just the beginning and I know it too well that more of these awesome bloggers are on the way. Just before I forget, you did a very wonderful and eye catching image here Enstine. This is what I call quality and dedication. You know this list will be lame without you man. Just look at what you are doing over there on your blog. there is every reason for one to want to connect and stay with you. Remember on Thursdays, I do present someone so this time around, I wanted to get many more people together. I know few of those and visit regularly. But definitely will be a regular to the others too. It will be great experience hooking up with these other bloggers. what a fantastic list of powerful names! I’m lucky enough to be familiar with 90% of these bloggers. And I take advantage to visit the few ones I don’t know yet. I really appreciate you including me in this post. To better days, as you always say! Why not create a post about me? So know I can’t praise my own dance! You have crafted a very post with amazing images. All these bloggers are not only top, but they are also a great inspiration to blog with passion. I know and network with most of the best blogging personalities which you’ve listed here, good to know about other bloggers. Will follow them for sure. Thanks for this nice consolidation, have a great weekend. That’s right! the reason for this post is to help us network so it will be great thing for you to follow them. All my faves are in this wonderful bunch except a few! Thanks Enstine for presenting these wonderful personalities! Keep continue to share your knowledge and experience on this line. It’s a wonderful year again with you on board. Like last year, this year will be great in blogging. I am honored to be listed with so many more, and yes, I DO know ALL of them. I guess that makes us all a close-knit family, more than anything else. I loved the way you did up the images for each one of us – and the little write up as well, which you are always so good at. So good to have you here despite being so busy. I perfectly understand what it means to run an active community. I can see ABC growing and I’ll like you to come over here again and talk uniquely about it. Any time I meet you online, we will talk about ABC focused interview so everyone around here should be part of it. I read almost every blog posts you have written here. Actually not only this blog, I was a fan of emfastincome blog also. But I think this is first time I comment on your blog. These are the best bloggers and I am following many of them. I’m value every moment you have spent on my articles. It’s worth a lot to me Ranuka and thanks for adding value to my blog. Well, Neil, John Chow, etc are big shots and I din’t want to mention them. Respectively, these are smaller bloggers that are giving so much to blogging and I think it’s time to start promoting them too. This is a very impressive list and for sure they are by all account awesome pro bloggers. I am not following all of them as yet but will do so after reading this post. The pictures represent the work of a creative genius. Thanks for raising the bar higher. Love them!!! so good to see you here and thanks for engaging. I took time to create those graphics and I’m glad you like them. First of all I have to agree with the others, the graphics you designed in this post are phenomenal and was one of the first things I noticed. I don’t have any design skills in me personally but I know good design when I see it, and this was very pleasing to the eyes. I really appreciate being mentioned among such an incredible group of bloggers. I wasn’t expecting it so it was certainly a nice surprise when I saw this post in my Feedly this morning. I’m familiar with most of the bloggers on this list but still have a few more I need to get to know, so I’m looking forward to that. I really love all the support and respect we all have for each other as bloggers. I’ve dealt with some nasty people in the past in other aspects of the business world so I really appreciate all the kindness we share. Like Donna said, it’s as if we’re a family of bloggers and that’s really something special to me. Again I appreciate the mention Enstine and I’ll talk to you soon. Good to see you here and thanks for taking the time to drop a comment. For the short time I have known you (though Jackson’s blog), I have been reading your blog including your interview on Joy’s blog. You have exceptional skills and that’s why I think my readers should know you better. As a matter of fact, I’ll be sending you a mail shortly for more collaboration. Wow Enstine what a fab surprise for me tonight! I saw Don tagged me on G Plus and it led me to this post. Everybody here is an A1 blogger and wow am I honored to make the list. So happy to help you with Broaded to 😉 We believe in you and love your hustle and hey, what are friends for, right? Thanks SO much again Enstine, and keep on inspiring! So glad to have been in your community and thanks for being beautiful man. What a nice surprise! I had no idea you were planning this awesome round up of bloggers. Thank you so much for including me in the bunch, I’m grateful and count it a real honor. The Lord is so good for allowing our paths to cross because I’ve been blessed by having you as a friend, that’s for sure. Thank you for so willingly sharing your knowledge and wisdom with me. You’re a good friend. It’s really the Lord’s doing and you are a gift to us. Just look at what’s happening on your blog. It will have been a mistake if I didn’t add you to this list. What great bloggers that you have mentioned. They are really awesome and are top notch in their industry. I have known some of them and they are wonderful people. Thanks for sharing. What a pleasant surprise to see your post and my name on this list. I’m honored and touched Enstine and I value your friendship and support. So glad we met and I definitely enjoy learning from you as well. A good bit of these bloggers on this list I consider to be my friends as well, that’s what I love about blogging. They are supportive, helpful, knowledgeable and just plain nice. Thank you so much for including me on this list and I appreciate all your recommendations my friend. You enjoy your week and hope all is going well for you. The blogosphere is getting so much from you in terms of valuable content and of course it will be of terrific value to hook up with you this year and beyond. Thanks for making blogging an awesome activity. I hope everyone reading this post gets to know more about you and your wonderful product. What an honor to be included with these bloggers! I know 15 of them but now I have 5 new blogs to go check out this week. I so appreciate you introducing me to new bloggers. It’s been great knowing you and all the great content you share on your blog to help bloggers going. I can’t tell you how grateful I am for you and your wisdom! It’s been awesome having conversations both privately and publicly on social media. We still need to do that Skype soon!!!! I’ve connected with many of the bloggers on your list at a deep and personal level and it’s excited and fun; and we are all building a collaborative community together that is propelling us forward. It’s an exciting time and the future is bright! Thanks Enstine for including me on your list! A ride with you is awesome and there was no way I could compile such a list without your face on it. I love the engagement with these bloggers and I can definitely say the future is bright. What a great post sharing the 20 top bloggers to follow. The design is just stunning. I am so grateful to see myself there and I thank you. I see most of my friends here too and love them all. I’m a fan of all their blogs. Hey…what about YOU? lol. I am your loyal fan my friend. You are always pumping out fantastic information. We are like a family of bloggers. When I look at all the above, I do feel the essence of family. Each one has their own expertise and all are of giving nature. I have to say that for such a young man James blows me away with his knowledge. It is such a pleasure to see someone so young really knowing the business. If only there were more young people choosing what he has done! This is beyond amazing Enstine! Just the graphics alone for each blogger are stupendously beautiful! You have certainly compiled a insightful list and I am honored to be included. By this point, I feel like that group is beginning to be what one could call a power-node. The energy around each of these people is strong, intelligent, caring and filled with expertise. Together the energies overlap creating a center of magnetism that draws people in and then gives them help, information, genuine regard. As a power-node we lift reader up both as a community and as individuals! super exciting comment with strong words. I love this and yes, I have been creating these graphics since morning. Took the whole day to get them worked out and I love the results.